Learn about this feline liver disease from BluePearl specialists. Cholangiohepatitis is a common form of liver disease that can affect cats of any age or breed. Cats with this disease develop inflammation of their liver and bile ducts (small vessels within the liver) that is sometimes associated with other concurrent diseases. Inflammation is an invasion from the bloodstream of different types of white blood cells that are active in the immune system. Cholangiohepatitis is classified as either an acute disease (termed suppurative) or a chronic disease (non-suppurative). Younger male cats seem to get acute cholangiohepatitis more commonly than female cats. The liver is responsible for a variety of important functions including the metabolism of carbohydrates and fats, the synthesis of proteins and vitamins, the storage of vitamins and iron, the production of substances necessary for blood clotting, and the removal or breakdown of toxins. Because the liver is involved in many crucial biologic functions, a cat with liver disease may show a wide variety of symptoms. These may include lethargy, anorexia (loss of appetite), weight loss, weakness, jaundice (yellowing of the skin, eyes and gums), vomiting, diarrhea and behavioral changes. Some cats are diagnosed early in the course of the disease before they develop clinical signs. The suspicion that a cat is suffering from liver disease is confirmed by physical examination, a thorough history including diet and medications, comprehensive bloodwork and abdominal ultrasound. The definitive diagnosis of cholangiohepatitis requires a biopsy of the liver. A biopsy can be performed surgically, via laparoscopy, or through the skin using a special needle under ultrasound guidance. Ultrasound-guided biopsies regrettably are not as informative as surgical or laparoscopic biopsies. The information obtained from the biopsy is necessary to determine the type and severity of liver disease, as well as allow an assessment of your cat’s prognosis and outline appropriate treatment options. 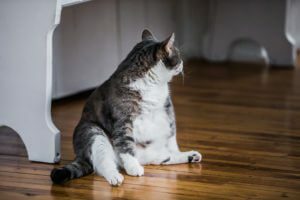 Some cats with cholangiohepatitis have concurrent chronic pancreatitis (inflammation of the pancreas) and/or inflammatory bowel disease (inflammation of the stomach and small intestines). When a cat has all three diseases simultaneously, it is termed “triaditis”. There are special blood tests that help your veterinarian determine if your cat might have this combination of diseases. Often, small biopsies of your cat’s intestines are obtained at the time of liver biopsy for analysis. Treatment of cholangiohepatitis can be complex and is determined by the severity and type of disease process in the liver, as well as the other associated organs. Hospitalization, intravenous fluid therapy, and supportive care may be necessary in severe cases. Acute cholangiohepatitis is often treated with longer term antibiotics, medications to help support liver regeneration, antioxidants and sometimes other supplements. Medications commonly used for chronic cholangiohepatitis include immunosuppressive or anti-inflammatory medications in addition to the medications listed above. 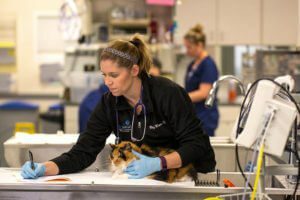 Treatment plans for cats with other concurrent diseases, such as chronic pancreatitis or inflammatory bowel disease, involve a combination of medications and diet that help treat each of these disease processes. The liver has an amazing ability to regenerate itself if the underlying disease can be treated. Cats with an infection of the liver can fully recover with the appropriate long-term treatments. The prognosis for cats with chronic cholangiohepatitis is more guarded. Some cats can be clinically healthy for long periods of time while other cats can have intermittent episodes of illness. Most cats require close monitoring by a veterinarian for the remainder of their lives. This might include periodic physical exams with blood work, changes in medications, and occasionally repeat diagnostics, such as an abdominal ultrasound.